Winning for Sarah and Sweetwater will be among the favorites on Thursday in Gulfstream Park’s feature race, a 6 ½-furlong allowance on dirt for fillies and mares 3-years-olds and up. 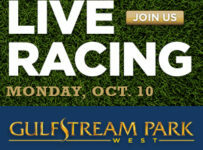 It is the eighth race with scheduled post of 4:58 p.m.
First post is 1:15 p.m. for the nine-race card. 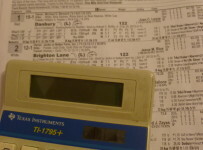 There is a carryover of $50,692 on the Rainbow 6, on races four through nine. The eighth race is a $44,000 allowance, with a $62,500 optional claiming price. There are seven entrants, with only Winning for Sarah and Celebrity Star in for a tag. Winning for Sarah could have an edge based on the class of her recent races and the possible pace scenario. She has been racing in overnight stakes and allowance races similar to the Thursday race level—with two wins and three other in-the-money finishes in her last eight starts. 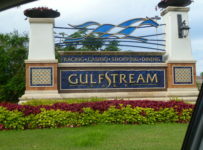 Those races have been at distances between six furlongs and seven furlongs at Gulfstream. Winning for Sarah likely will be racing from mid-pack, in a race where Sweetwater and as many as three other horses could contest the early lead. Sweetwater has won two of her last three starts—all at Gulfstream at lower claiming levels than the Thursday race. One win was at 6 ½ furlongs and the other was at six furlongs. Dogwood Trail, Diamond Earring and Celebrity Star also have histories of early speed. Jesus Rios will ride Winning for Sarah for trainer Jena Antonucci. Tyler Gaffalione has the mount on Sweetwater for trainer Saffie Joseph Jr.